As a world-class metropolis, Atlanta has its fair share of popular tourist attractions. Most people who have been to the host city of the 1996 Summer Olympic Games flocked to its famous Georgia Aquarium, CNN Center, and World of Coca-Cola. But there’s a lot more to discover around Georgia’s capital city thanks to constant growth, its neat neighborhoods, and a history that goes way back to when Native American communities flourished on its riverbanks. We did not fly half way around the world to capture this image. So I’m going to compile an insider’s ever-expanding guide to the best and most interesting things that metro Atlanta has to offer but people may not know about because they are off the beaten path. I will also treat this post as my personal bucket list, since Johnny and I have yet to visit some of the places that I mention below. Note: I purposely leave out most dining establishments because that’s going to be a super long list on its own. Not many people know that there are Egyptian mummies on display in the city of Atlanta. Perhaps one of the reasons is because they are housed in a small museum on Emory University’s campus. Carlos Museum may be compact, but it has an outstanding collection of artifacts from ancient civilizations around the world. The museum also regularly hosts intimate concerts given by the Emory Chamber Music Society, which was named “Best Chamber Music Group in Atlanta” by Atlanta Magazine. This is a newly renovated museum located inside Delta’s original hangars from the 1940s. Being a travel enthusiast, I wouldn’t mind spending some time at this facility to take a closer look at aircraft from different periods of time and to learn more about the history of aviation. Johnny and I have wanted to visit this transportation history museum for a very long time. I’m really looking forward to riding in the restored cabooses and taking a peek at the private car that was once used by President Warren G. Harding. Would you like to learn how the Federal Reserve handle the circulation of money? Have you ever seen rare coins and currency? Atlanta’s Fed lets you tour their museum free of charge – all the more reason to take your whole family to experience this one-of-a-kind opportunity. We are always on the lookout for quirky roadside attractions, but there’s one that’s literally around the corner from where we live that we have never been to – The Waffle House Museum in Avondale Estates. For those not familiar with Waffle House, it is a chain restaurant popular in the southern region of the United States. The museum is the site of the original Waffle House, and it’s been restored to look and feel like when it was first opened in 1955. Atlanta is home to the country’s Centers for Disease Control and Prevention (more commonly known as the CDC). The museum can be found at the CDC Headquarters, and it’s a good place to educate yourself on various public health issues. 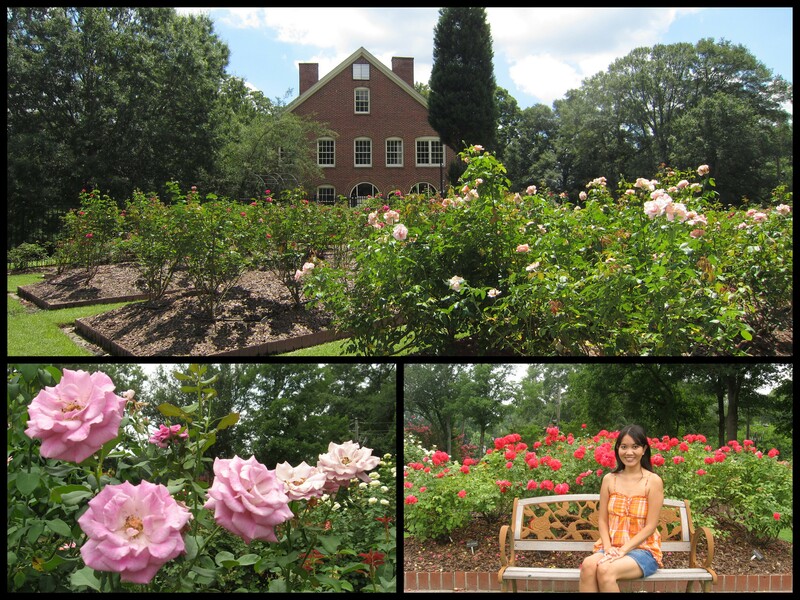 If you want to immerse yourself in the beauty of thousands of colorful roses, head to the Robert L. Staton Rose Garden. It is tucked away at Fernbank Museum of Natural History. Well, it used to be at Fernbank, but now apparently it’s being relocated to the Georgia Governor’s Mansion. So we will have to check it out again when it reopens sometime in 2015. The replica of President Jimmy Carter’s White House Oval Office is a must-see inside the Museum of the Jimmy Carter Library. But don’t forget to stroll the beautiful grounds and gardens behind the building. 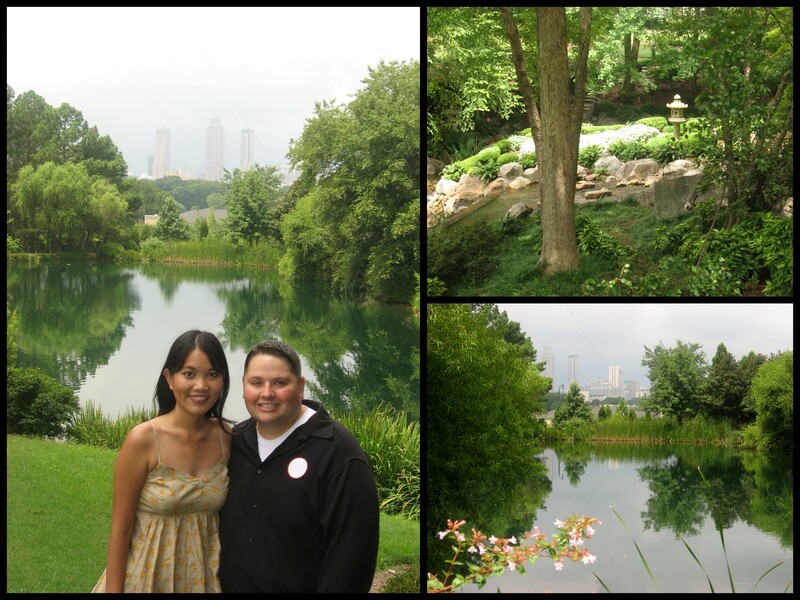 There are sculptures, two small lakes, and a Japanese Garden with nice views of the downtown Atlanta skyline. One of these days I will set aside time to wander around the lovely Gibbs Gardens in Ball Ground, Georgia. All pictures that I have seen of Gibbs Gardens are so serene and inviting. Every spring, over 50 acres of the land is covered with daffodils, making it one of the largest daffodil gardens in the United States. I am also interested in attending the Japanese Maples Festival that’s held in mid-October through mid-November. Kennesaw’s Smith-Gilbert Gardens has an interesting beginning. It all started when in 1970 Mr. Richard Smith and Dr. Robert Gilbert acquired the Hiram Butler House (ca. 1880), once the residence of a Confederate railroad man. Over the next three decades they developed the home and surrounding grounds into the present day Smith-Gilbert Gardens. A prominent feature of the 16-acre estate are the unique outdoor sculptures that are peppered throughout the gardens. Wouldn’t you love to take a respite from the hustle and bustle of Atlanta’s Buckhead district at Grand Hyatt’s Japanese Garden? I can imagine listening to the soothing sound of the cascading waterfall and relaxing among the greeneries. I first discovered this hidden gem when I was a student at Emory. My friends and I were looking for a quiet space to spend our afternoons once classes were over. We loved feeding the geese by the lake, or sitting under the huge trees to take a break after hiking the trails. The park also has mini waterfalls, a suspension bridge over a creek, and the stone ruins of a powerhouse. On top of the hill you’ll find a 1926 Tudor mansion (called Lullwater House) that is the official home of Emory’s president. Sometimes it can be difficult to find a natural setting that’s left completely untouched in a large city like Atlanta. Panola Mountain State Park is one of those exceptions. Panola Mountain is a 100-acre granite outcrop that is reminiscent of the popular Stone Mountain, minus the crowds. It is part of the Arabia Mountain National Heritage Area, one of only three National Heritage Areas in Georgia. The city of Avondale Estates derived its name from the birthplace of William Shakespeare, Stratford-upon-Avon. 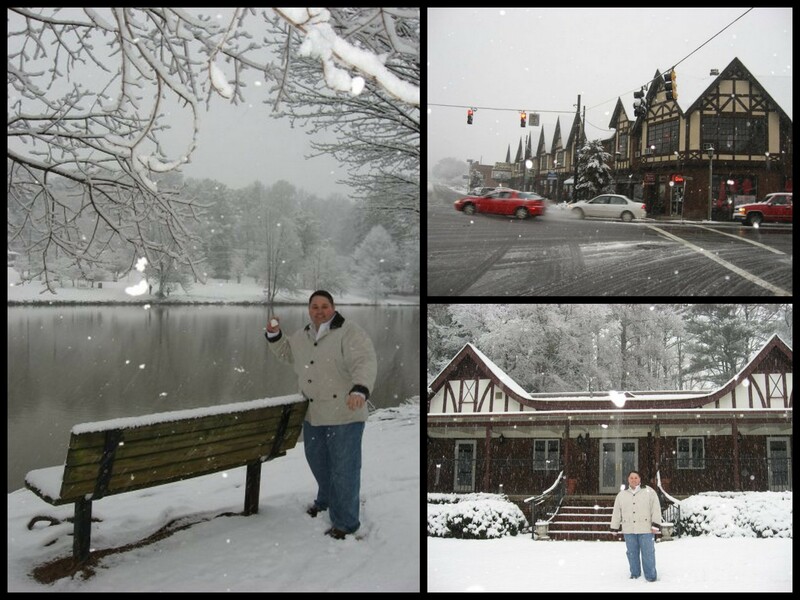 It is absolutely one of my favorite communities in the Atlanta area. The Tudor-style downtown buildings and houses will make you feel like you’re somewhere in England. The downtown area is slowly being revitalized, and locally-owned shops and restaurants are starting to occupy the once abandoned spaces. One of Avondale’s newest eateries is Palookaville, owned by TV personality Jim Stacy, and known for its corndogs and over thirty soda fountain syrup flavors. Acworth was once a Georgia railroad town. Nowadays, the Historic Downtown District is a lively place where people come to shop and dine inside its charming buildings from the Victorian era. Johnny and I would occasionally make a special trip to Acworth just so that I can satisfy my Cajun food craving at Chef Henry’s Louisiana Grill. Less than an hour north of Atlanta, precisely in Bartow county, lie earthen pyramids built by the people of Etowah chiefdom. These mounds were constructed between 700-1000 years ago. Today the site also includes a museum that displays objects excavated from inside and around the mounds. 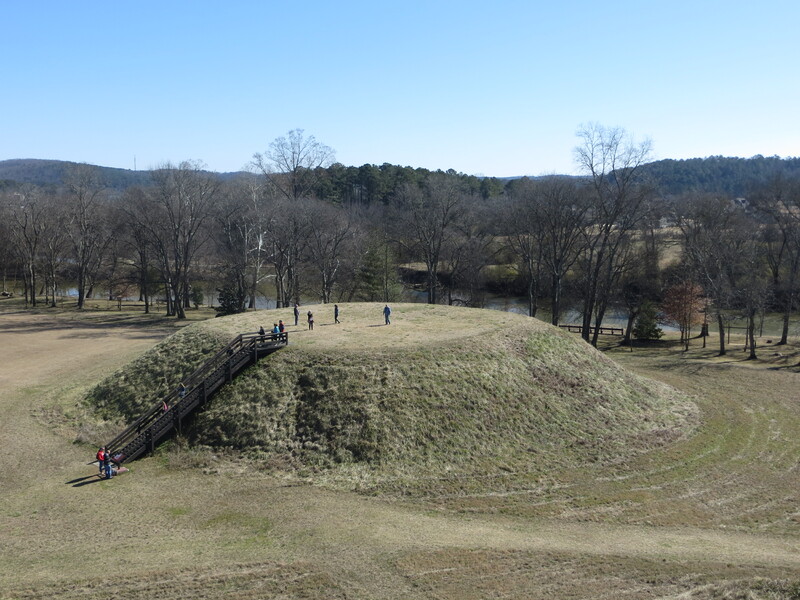 The complex is regarded as the most intact example of the Mississippian culture in the southeastern United States. 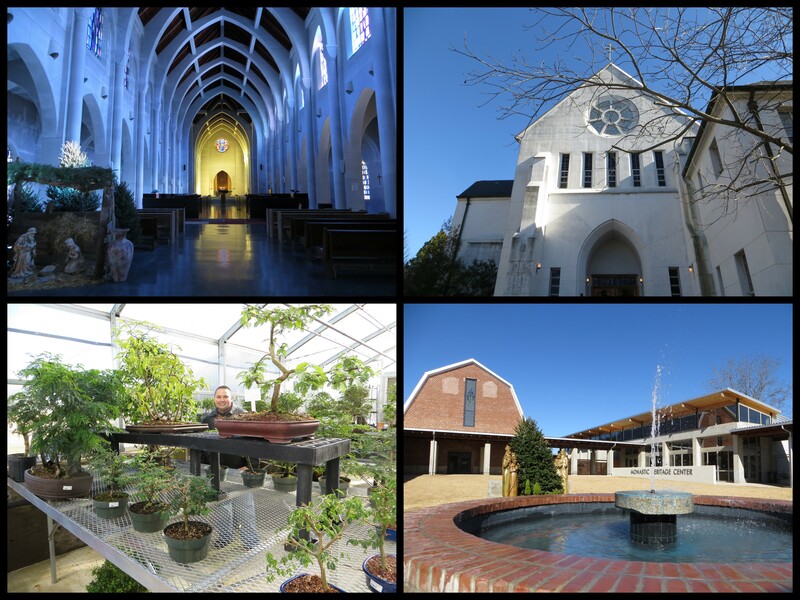 A tranquil site for contemplation, this monastery in Conyers is where more than 40 monks live, work, and pray together. Visitors can take a walk along the Rockdale River trail, pray at the Abbey Church, and stop by the museum and Abbey Store. The monastery is also well known for its bonsai collection and delicious home-made fruitcakes. 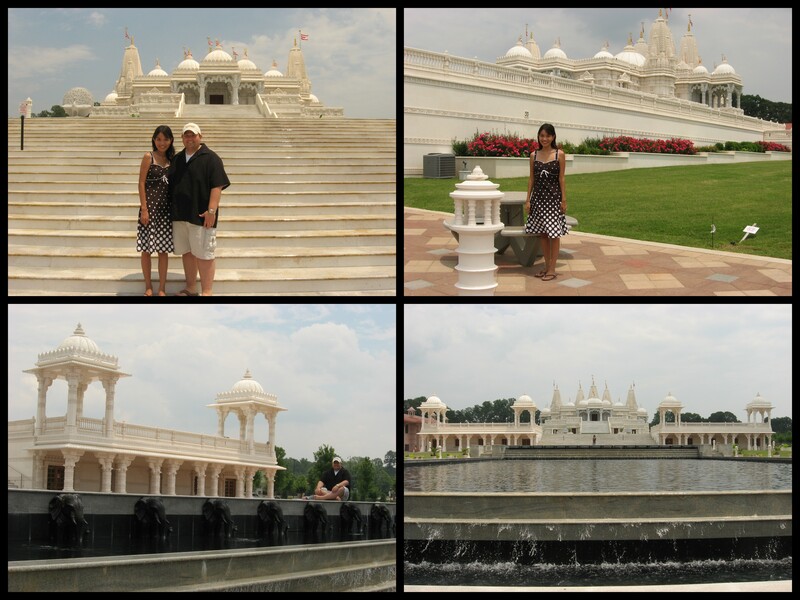 Johnny and I came across this impressive Hindu temple as we were running errands not too far from home. Its location in Lilburn is nondescript – behind a Walgreens drugstore and across the street from a Publix grocery store. But enter the gate and you’ll soon admire the grandeur of this structure. 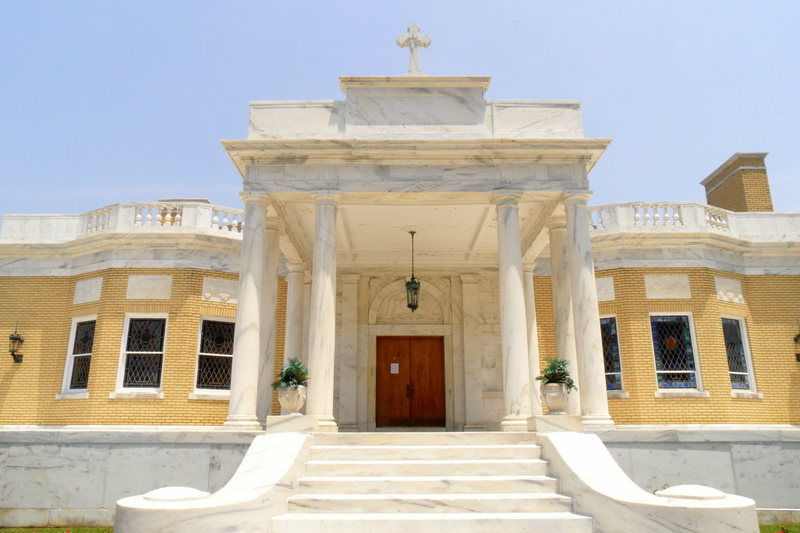 The temple opened in 2007, and was constructed using three types of stone: Turkish Limestone, Italian marble, and Indian pink sandstone. 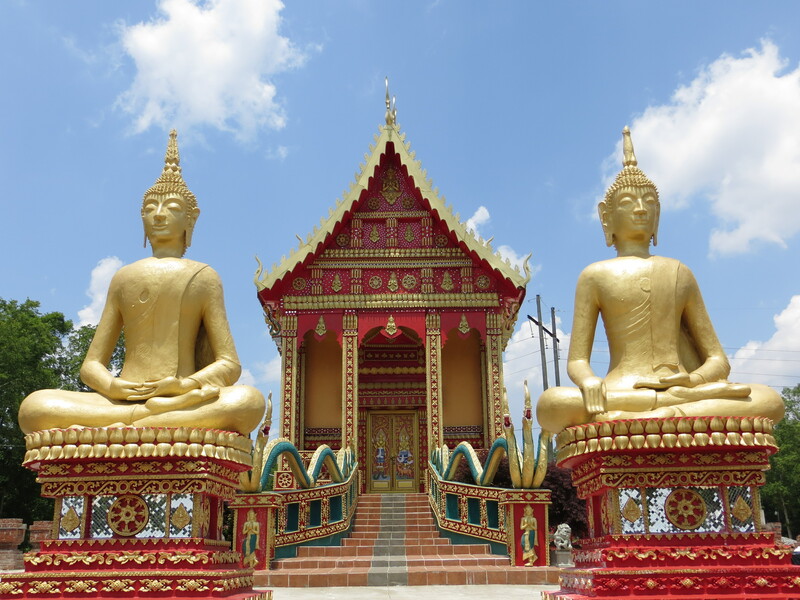 After we passed by this Buddhist temple a few times on our way out of town, we decided to visit it one Sunday morning. 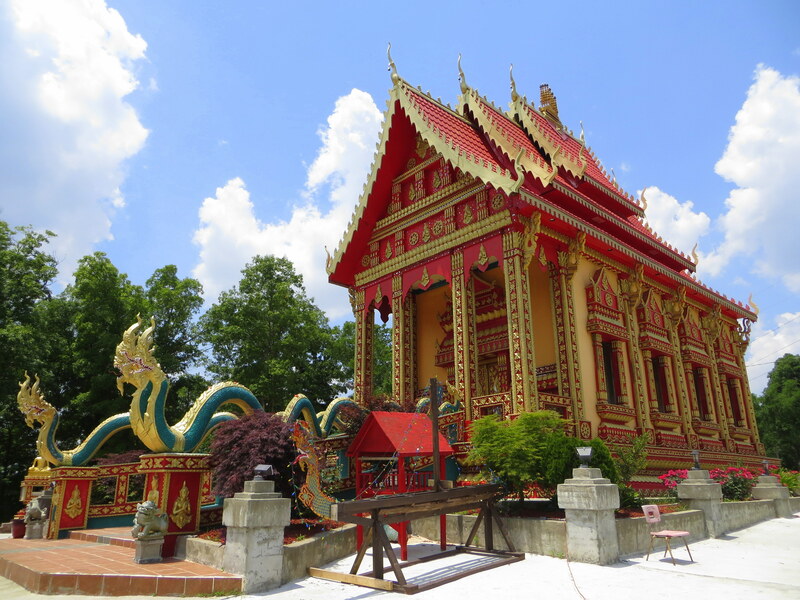 There was no one around, so we could not go inside nor ask about the background of this beautiful temple in Conley, Georgia. In the spring time, the Solarium in Decatur hosts free outdoor concerts called Oakhurst Jazz Nights. A century ago, the facility functioned as an orthopedic surgical hospital for those who could not afford to pay for care. Georgia children affected by polio were brought in for treatment to this hospital. 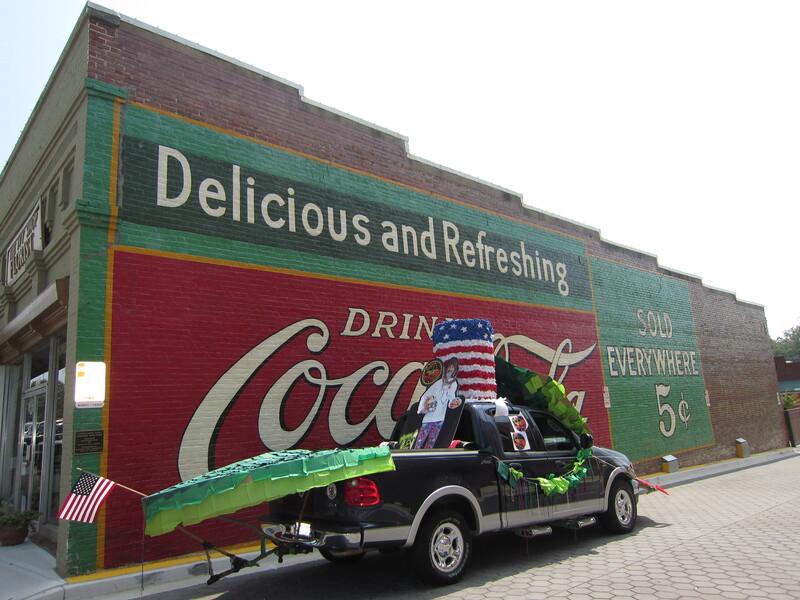 There are lots of Coca Cola connections in the city of Atlanta. And that includes Callanwolde, which was at one time the home of the oldest son of The Coca Cola Company’s founder. Designed as a Tudor Revival style mansion, Callanwolde is now an education center that offers a variety of arts programs and classes. 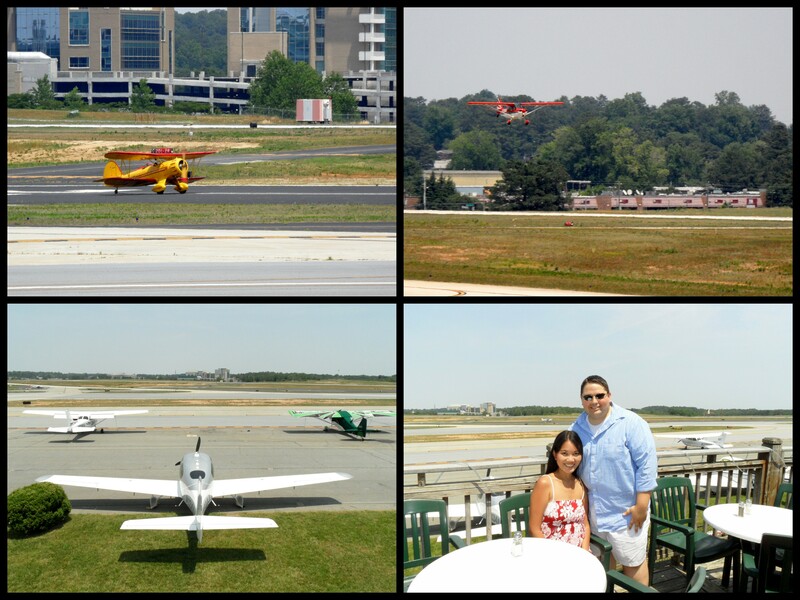 Dekalb Peachtree Airport (PDK) has two restaurants on its premises: Downwind Restaurant and Lounge and 57th Fighter Group. I’ve never been to 57th Fighter Group, but Johnny and I once had lunch at Downwind Restaurant, which is on the second floor of the main terminal. We were seated on the patio that directly overlooks the runway. I remember us enjoying burgers while yards away small airplanes come and go. Definitely not your typical lunch date! Do any of the places on this list interest you? If you are an Atlanta resident or have visited the metro Atlanta area, do you have a favorite local spot you can recommend? This is a great collection. I used to spend a lot of time in Atlanta as I was in a relationship with someone there. I also get there from time to time on business and have not been to many of these places! What a great list. Thanks for sharing! Thanks for stopping by our blog! I hope you find the list helpful for any future trips to Atlanta. My husband and I are still working on visiting quite a few of these places ourselves. We keep postponing things, and I guess that’s how it is when it comes to checking out sites in one’s own backyard. This is one serious all inclusive blog post – what a fab resource! Tuan, thank you for stopping by and reading my blog post. I’m glad that it could be helpful in planning your next trip to Atlanta.